You've got to prove it's the US doing it, says Judge Dawson. 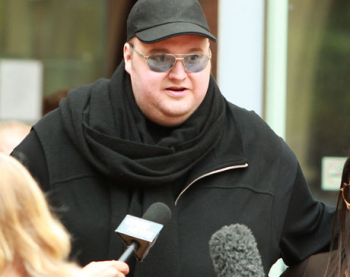 Kim Dotcom's extradition to the US has yet to be decided one way or the other. One of his concerns is that, according to an application made to Auckland's District Court, "he or his family may have been subjected to surveillance activities undertaken by or on behalf of the applicant [the US government] that would be prejudicial to Mr Dotcom at the extradition hearing to be held." Judge Dawson has said that yes, Dotcom is probably being spied on, even now. But his application still fails, because Dotcom would have to show that it was the US, specifically, that was spying on him, in order to make his case. Dotcom's been having all kinds of phone problems. His iPhone battery keeps dying unexpectedly, a possible symptom, he says, of Trojan infection. The spyware could be increasing battery usage, as it communicates with the people who installed it. He's had some very odd experiences when calling his lawyer, William Akel, which could mean that his attorney-client privileged communications are being intercepted by the NSA. The most intriguing symptoms occur when Dotcom's at his rural Coatesville property, which has lousy cellphone reception. He installed a few extra signal boosters, but they didn't help much. He resigned himself to poor reception, only to discover one day that he was getting a perfect signal. Except it wasn't thanks to his provider, Vodaphone. "The closest cell tower is five kilometers away," says Dotcom. "We shouldn't have five bars' signal strength. The only logical explanation is Stingray, which simulates a cell tower, makes your mobile connect to it because it's the strongest signal source." Stingray is a surveillance device, known to be used by US intelligence agencies. The court accepted that it was "likely", but not proved, that surveillance had occurred. Even so, without direct evidence that the US was involved - evidence that Dotcom is unlikely ever to be able to provide - there's no reason to think he wouldn't have a "fair and just extradition hearing." That hearing's scheduled for April 2014.